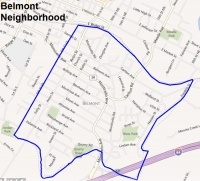 Belmont-Carlton is a neighborhood in the southeast corner of Charlottesville. It includes Avon Street, Monticello Avenue and Road, Carlton Avenue and Road, Rives Street, and the areas known as Hogwaller, Big Hill, and Coal Bin. The borders of the neighborhood are 6th Street SE, Moores Creek (the border with Albemarle County), and the CSX railroad tracks. Belmont became attractive as an expansion area for the new city of Charlottesville in the late 19th century due to its location along transportation corridors to the James River and Scottsville. The Three Notched Road led east to Richmond. The Scottsville Road wound along what is now 6th Street E. But it was the development of the 551 acre Belle Mont Estate that let to a grid system that now helps define Belmont's character. At this time, a portion of the rolling estate was known as the Commons because anyone was allowed to graze their cattle there. Downtown Belmont is home to several eating establishments, including The Local, Tavola, Mas, La Taza Coffee House, Belmont Bar-B-Que, and formerly, the infamous Bel Rio restaurant. .
↑ 1.0 1.1 "Featured Neighborhood: Belmont-Carlton." In Our Backyard (May-Jun. 2007). City of Charlottesville. Retrieved 11 June 2009. ↑ 2.0 2.1 Location Belmont-Carlton Neighborhood Association retrieved 9 Jul 2009. ↑ 3.0 3.1 3.2 3.3 Web. Belmont - A History of a Neighborhood, James H. Buck Jr., Paper for James Kinard's Local History course, May 1980, retrieved June 30, 2014. This page was last edited on 28 July 2014, at 13:44.